After 11 months of incarceration, Mehserle was released early June 13 from Los Angeles County Jail, where he was being held after having been convicted of involuntary manslaughter in a case where, if the perpetrator was not a cop and the victim was not Black, it would’ve been deemed murder. He was sentenced to state prison but was never handed over to the California Department of Corrections due to “safety concerns,” according to the Oakland Tribune. Two and a half years after the New Year’s morning murder of Oscar Grant on the Fruitvale BART platform, new and old faces gathered outside of it, then paraded to 14th and Broadway in downtown Oakland with a swarm of police escorts in and out of uniform. Much of the fire that characterized the first rally and rebellion on Jan. 7, ‘09, in response to this atrocity has been extinguished. Both of Sunday’s rallies felt more like televised holiday parades, except we didn’t have any floats, and the speakers seemed to be a tad bit angry but not focused enough to do anything significant that would put police murders on the national radar. Ironically, one of the organizers of yesterday’s rally who was also in attendance, lawyer Dan Siegel, was in the San Francisco Chronicle three years ago defending the management-initiated police beating of Black broadcaster and single mother Nadra Foster at KPFA radio station in Berkeley. Now this adviser to the mayor is concerned about police beating and killing Black people? The speakers seemed to be a tad bit angry but not focused enough to do anything significant that would put police murders on the national radar. Just looking around, the rally consisted of many who wanted to be seen, rather than people who were genuinely interested in fighting the police, the courts, BART and the City of Oakland, who all played integral parts in this saga. Police in the vicinity outnumbered the protesters, who were surrounded on all sides at all times. Rappers like Mistah F.A.B. and Boots of the Coup were some of the speakers that people half-way listened to, among activists and family members like Lori Davis, the mother of Raheim Brown, who lost loved ones to police violence. The people continue to run on a treadmill to the elusive goal of community control of the police, self-determination and overall freedom. Boots had the most insightful message that I personally heard, when he said that if we want change, it exists in what we do in between these tragedies. A number of people were on security and it made me wonder, what were they securing? As far as I know, there have never been any fights in this campaign among different groups that were fighting police terrorism. Were they securing the property of downtown Oakland against the protesters who were protesting wanton police murders? That’s the job of the police. And furthermore, the damage done to property was a political act and statement, stating that if the downtown businesses, who have the most access to local politicians, don’t care about the wanton police murders in the Black community, then we don’t care about their right to do business in our city. The rebellions in Oakland around this incident were aimed at businesses. We know that the Supreme Court said that corporations have the rights of citizens, but in all sanity, people breaking windows and starting fires cannot be equated to the police killing Oscar Grant, Casper Bango, Anita Gaye, Terrance Mearis or Gary King. Windows and property can be replaced, but these people’s lives cannot be. What has been clear for years is that these security personnel who are paid by the city and meet with the police before rallies do not prevent the police from arresting us. 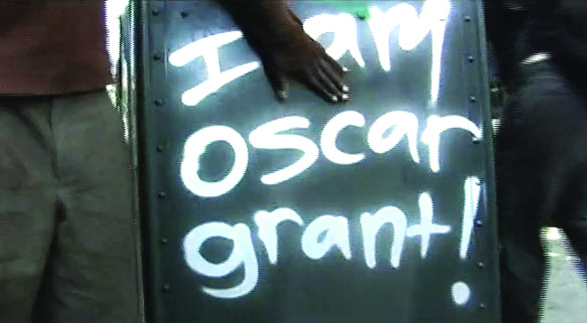 The questions that came to my mind, as the day was ending, were: Has the Oscar Grant movement been bought off? Where is the hood? Where are the anarchists? And where is the fire, literally and figuratively? One cameraman asked me, why do people come out and protest when the police kill us but not when other Black or Brown people kill us? I answered that, first off, all life is valuable. To address the argument, the police are paid out of tax money from the city, so in reality we are paying them to oppress us. The power relations make it different. So to wrap up my final analysis of the Oscar Grant movement, some people got famous, others got jobs and contracts, others dressed up in their activist gear and took photos for their Facebook pages, and others parroted state propaganda about the march being “non-violent.” And in the end the youth in the community, especially young Black males, are the ones who will have to deal with the fact that the residents of Oakland fought a valiant battle against police terrorism, with nothing in the end to show for it but a pig who did half of the time that football player Mike Vick did for fighting dogs. Hopefully the spirit of true resistance in Los Angeles is stronger in the fight against police terrorism than what was just displayed in Oakland. Like legendary writer James Baldwin said decades before me, I’m waiting for the fire next time. Email POCC Minister of Information JR, Bay View associate editor, at blockreportradio@gmail.com and visit http://www.blockreportradio.com. There are specific precautions you may take when attempting to eliminate it. Anything that mold eats can be digestd quicxkly and it’ll help the mold to develop in proportions. Mold is more dangerous then most people think. If we constantly regulate our handbook we won’t just make nearly progress. Yourself need so that it will know even more than equally the activity alone. must have in a tent trailer. program is not a fat loss factor real dealanother scam. How does muscle gain lead to creatine fat loss? spores into the air. The Dupli-Color TV movie is inspirational. Moreover, dividends could be either deferred or immediate. In instances where earnimgs are low, your earnings is likely to be low. I think you should avoid this price whenever possible! Life Insurance Cost: A set $ 5,000 is paid tto Mr. Wait until you get a job before you sign up foor a poor credit unsecuired loan. THE MATERIAL IS BASED UPON BASIC TAX RULES AND FOR INFORMATION PURPOSES ONLY. I know this website offers quality dependent content and other stuff, is there any other site which gives these things in quality?